THIS fine work is situated in Butler county, Ohio, on the west side of the Great Miami river, three miles below the town of Hamilton. The plan is from a survey by JAMES MCBRIDE, Esq., and the description is made up from his notes. The hill, the summit of which it occupies, is about a half mile distant from the present bed of the river, and is not far from two hundred and fifty feet high, being considerably more elevated than any other in the vicinity. It is surrounded at all points, except a narrow space at the north, by deep ravines, presenting steep and almost inaccessible declivities. The descent towards the north is gradual; and from that direction, the hill is easy of access. It is covered with a primitive forest of oak, hickory, and locust, of the same character with the surrounding forests. 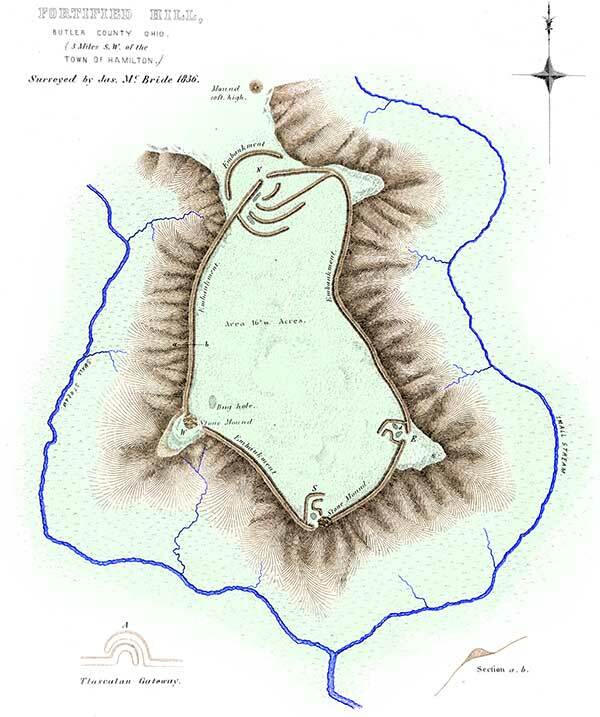 This is a Lidar image of the Fortified Hill earthworks as it appears today. A faint outline, highlighted in blue, of the eastern side of the fortification is faintly visible. 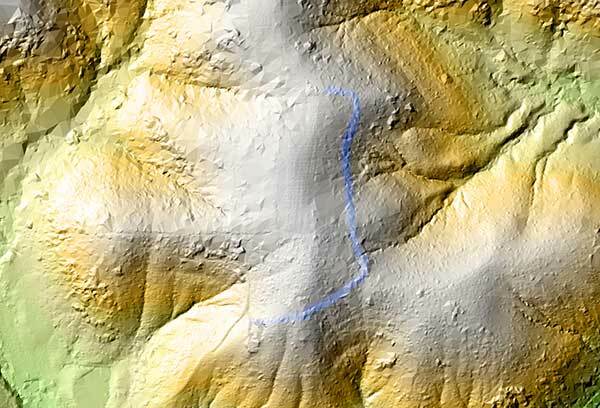 Better Lidar would reveal more of the earthworks. Skirting the brow of the hill, and generally conforming to its outline, is a wall of mingled earth and stone, having an average height of five feet by thirty-five feet base. It has no accompanying ditch; the earth composing it, which is a stiff clay, having been for the most part taken up from the surface, without leaving any marked excavation. There are a number of "dug holes," however, at various points, from which it is evident a portion of the material was obtained. The wall is interrupted by four gateways or passages, each twenty feet wide; one opening to the north, on the approach above mentioned, and the others occurring where the spurs of the hill are cut off by the parapet, and where the declivity is least abrupt. They are all, with one exception, protected by inner lines of embankment, of a most singular and intricate description. These are accurately delineated in the plan, which will best explain their character. It will be observed that the northern gateway, in addition to its inner maze of walls, has an exterior work of a crescent shape, the ends of which approach to within a few feet of the brow of the hill. The excavations are uniformly near the gateways, or within the lines covering them. None of them are more than sixty feet over, nor have they any considerable depth. Nevertheless, they all, with the exception of the one nearest to gateway S, contain water for the greater portion, if not the whole of the year. A pole may be thrust eight or ten feet into the soft mud, at the bottom of those at E.
At S and W, terminating the parapet, are two mounds, each eight feet high, composed of stones thrown loosely together. Thirty rods distant from gateway N, and exterior to the work, is a mound ten feet high, on which trees of the largest size are growing. It was partially excavated a number of years ago, and a quantity of stones taken out, all of which seemed to have undergone the action of fire. The ground in the interior of this work gradually rises, as indicated in the section, to the height of twenty-six feet above the base of the wall, and overlooks the entire adjacent country. The character of this structure is too obvious to admit of doubt. The position which it occupies is naturally strong, and no mean degree of skill is employed in its artificial defences. Every avenue is strongly guarded. The principal approach, the only point easy of access, or capable of successful assault, is rendered doubly secure. A mound, used perhaps as an alarm post, is placed at about one-fourth of the distance down the ascent; a crescent wall crosses the isthmus, leaving but narrow passages between its ends and the steeps on either hand. Next comes the principal wall of the enclosure. In event of an attack, even though both these defences were carried, there still remains a series of walls so complicated as inevitably to distract and bewilder the assailants, thus giving a marked advantage to the defenders. This advantage may have been much greater than we, in our ignorance of the military system of this ancient people, can understand. But, from the manifest judgment with which their defensive positions were chosen, as well as from the character of their entrenchments, so far as we comprehend them, it is safe to conclude that all parts of this work were the best calculated to secure the objects proposed by the builders, under the modes of attack and defence then practised. 15. De Solis describes this Tlascalan work as "a great wall which ran from one mountain to the other, entirely stopping up the way: a. sumptuous and strong piece of building which showed the power and greatness of the owner. The outside was of hewn stone cemented with mortar of extraordinary strength. It was twenty feet thick and a fathom and a half high; and on the top was a parapet after the manner of our fortifications. The entrance was narrow and winding; the wall in that part dividing and making two walls, which circularly crossed each other for the space of ten paces.”—History of the Conquest of Mexico, p. 139.